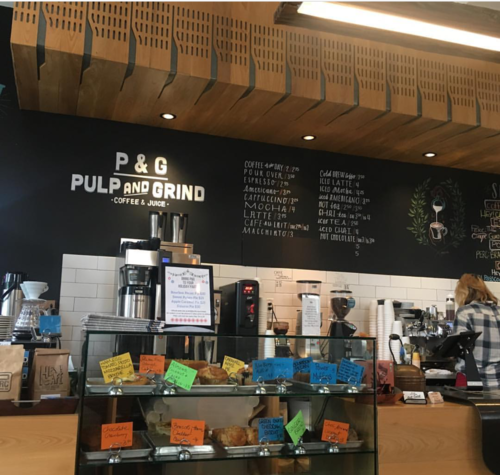 Owned by the team behind Bywater and Uptown favorite Satsuma Cafe, Pulp and Grind serves up excellent coffee and fresh juices. Pre-bottled, cold-pressed juice blends are an excellent way to recharge and recover. Coffee and espresso offerings cover the classics, from mochas to cafe au lait. 644 Camp Street. A local roaster with great pour-over and drip coffee, Mojo also offers breakfast, lunch, dinner, and late-night casual dining options. The small-batch coffee is roasted in-house, and its location on Magazine Street is always bustling. Mojo is the perfect spot to relax and take in New Orleans. 1500 Magazine Street. A funky, inviting spot in Mid City, Fair Grinds is New Orleans' only 100% Fair Trade coffeehouse - exclusively serving Fair Trade coffee, tea, and chocolate. The inviting two-story Ponce de Leon Street establishment's name is a play on the name of the nearby racetrack. 3133 Ponce de Leon Street. Located in the new Ace Hotel. Cold Brew is the primary focus at Stumptown - think nitrogen-infused cold brew and mixed coffee drinks poured from a brass and marble tap system. The cafe also makes coffee cocktails, like the refreshing mint julep-inspired Endless Summer with nitro-charged cold brew, mint simple syrup and sparkling water. 610 Carondelet Street. Known for its iced coffee, this funky Magazine Street coffee shop has turned its small coffee roaster into a local powerhouse, having transitioned from roasting for its shop only to selling its product in stores all over town. For an interesting take on coffee, try the coffee saison, which was created with help from NOLA Brewing and Left Hand Brewing. 4332 Magazine Street. Enjoy pour overs and cold brews creations from this New Orleans-based southern coffee house chain. Also available are kombucha, baked goods from Gracious Bakery, and creative coffee drinks like The Weekender, made with tangerine juice, half & half, sparkling water, and a dash of vanilla, and topped with a shot of espresso. 637 Tchoupitoulas Street.